Director – Sam Raimi, Screenplay – Ivan Raimi & Sam Raimi, Producers – Bruce Campbell & Robert Tapert, Photography – Bill Pope, Music – Joseph Lo Duca, March of the Dead Theme – Danny Elfman, Visual Effects – Introvision Inc (Supervisor – William Mesa), Mechanical Effects Supervisor – Vern Hyde, Makeup Effects – Alterian Studios (Supervisor – Tony Gardner) & KNB EFX, Production Design – Tony Tremblay. Production Company – Renaissance Pictures/De Laurentiis Communications. Ash is thrown back to the 14th Century by the demonic timewarp. There he is captured by the troops of Lord Arthur but awes them into thinking that his chainsaw and shotgun are magic weapons. To return home he must retrieve a copy of The Necronomicon from a graveyard. However, his bumbling ends up creating an evil doppelganger of himself and raising an army of the dead. As the undead army marches on Lord Arthur’s castle, Ash is reluctantly persuaded to teach the peasantry chemistry and steam power to defend against the onslaught. Army of Darkness was the third of Sam Raimi’s Evil Dead films. Sam Raimi had debuted as a director with the ferociously entertaining no-budget success of The Evil Dead (1981) and then went onto the hilariously gonzo The Evil Dead II (1987). With these two films, Raimi established himself as a cult name. Both of the films show Sam Raimi as having an amazingly demented creative energy and increasingly a love of wacky sight gags. Raimi always left the end of The Evil Dead II open for another sequel, which was announced for a time under the title The Medi-Evil Dead and subsequently emerged here. 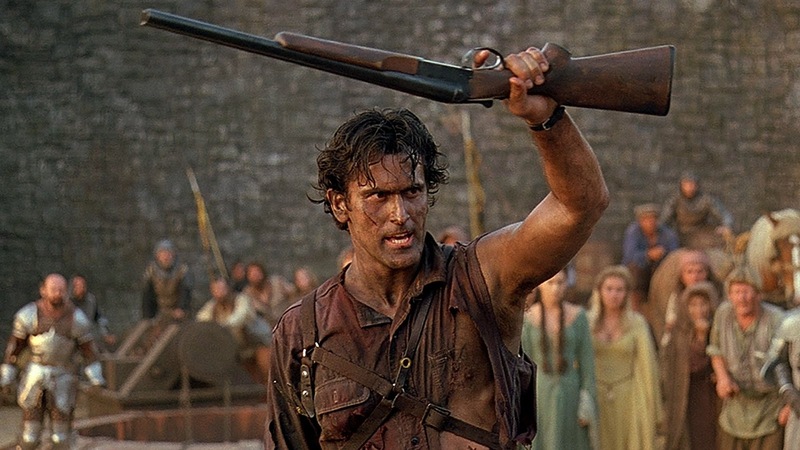 Army of Darkness proved a problem-ridden production with the Evil Dead copyright and the film’s release caught up in the legal wrangling from the financial collapse of De Laurentiis Entertainment Group, which had backed the second film, as well as various different endings that were filmed, scrapped and reshot. Army of Darkness is the biggest budgeted film of the Evil Dead trilogy and certainly the most ambitious in scope. The other films were more or less the assault on one person in an isolated valley; however, Sam Raimi envisions this film as no less than a full-scale mediaeval war with the forces of darkness. The sword duel sequence with the skeletons in Ray Harryhausen’s Jason and the Argonauts (1963) may well have served as the inspiration for much of the film. Here Sam Raimi builds Harryhausen’s sequence into an extended climax with an amazing partly mechanical, partly stop-motion animated comic sequence with skeletons marching to war, crashing the castle gates with a siege breaker and a series of dazzlingly paced human/skeleton swordfights. 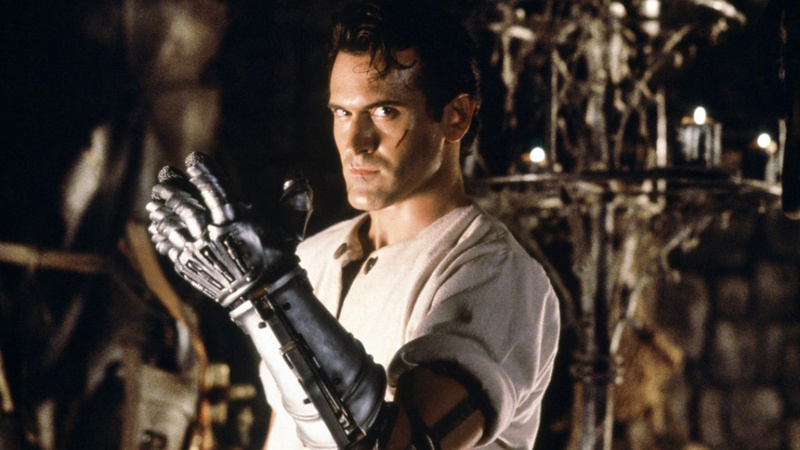 For all that, Army of Darkness is far less a film than one expected it would be, having neither the full tilt energy that The Evil Dead did, nor the demented comic humour of The Evil Dead II. If there is a style that is characteristic of this film, it is one of slapstick. Sam Raimi plays things so broadly that there is almost no horror in the film at all. At its most irritably broad, he features the likes of Bruce Campbell and his evil joined-at-the-shoulder double doing Three Stooges routines or a manic sequence in a graveyard with Campbell dancing as he is pinched, tweaked and poked over every conceivable inch of his body by skeletons. The film does have enough comic moments and succeeds enough of the time to remain likeable – like the moment when Campbell opens the trunk of the Oldsmobile and finds a copy of Chemistry 101 and a book on steam technology, which makes a highly amusing joke on the survivalist cliches of time travel films. The film’s one ace in the hole proves to be Bruce Campbell who has mastered his deadpan parody of lantern-jawed heroism and macho stolidity to the point of perfection and succeeds in carrying the film. Despite these odd moments, Army of Darkness lacks energy. The middle with the quest into the graveyard seems too obviously to be just showcasing one novelty effects sequence after the other. Raimi seems to forgotten the ability he demonstrated on Evil Dead II of taking each sequence to the heights of comic delirium. Nor is the film structured that well as story – not that the other films can make claim to that either. For his conscious setting of the film against a period fantasy backdrop, even as a parody, Raimi fails to use of the story cycle he draws on – unlike the way he successfully parodied the heroic cycle with his tv series Hercules: The Legendary Journeys (1994-9) and Xena: Warrior Princess (1995-2001) – the romance seems inconsequential, Ash’s quest seems no more a there-and-back issue followed by a climax and the travails he encounters along the way seem only to be randomly inserted effects or comic sequences. Evil Dead (2013) was a further remake of the original. Bruce Campbell then reprised his role in the tv series Ash vs Evil Dead (2015-8). Also of interest is My Name is Bruce (2007) in which Bruce Campbell plays himself who is mistaken for Ash and required to fight a monster. Sam Raimi’s other genre films include:- the bizarre cartoonish crime drama Crimewave (1985); the dark superhero film Darkman (1990); the psychic thriller The Gift (2000); the trilogy of Marvel Comics adaptations Spider-Man (2002), Spider-Man 2 (2004), Spider-Man 3 (2007); the horror film Drag Me to Hell (2009); and Oz: The Great and Powerful (2013). Raimi also co-wrote the Coen Brothers fantasy film The Hudsucker Proxy (1994) and produces the zombie film The Dead Next Door (1989) under the pseudonym The Master Cylinder. Sam Raimi has also had some success with his Renaissance Pictures production company, who have been particularly enterprising in the field of television fantasy. Theatrically, Renaissance have produced the bizarre Lunatics: A Love Story (1991), John Woo’s American debut Hard Target (1993) and the Van Damme time-travelling action film Timecop (1993). On television, Renaissance have produced such genre works as the superhero series M.A.N.T.I.S. (1994-6), the smalltown Deviltry show American Gothic (1995) and then had enormous hits with the dual successes of the tongue-in-cheek revisitings of Greek myth and sword and sorcery with Hercules: The Legendary Journeys (1994-9) and Xena: Warrior Princess (1995-2001). These were followed by similar tongue-in-cheek series as Young Hercules (1998-2000), the futuristic Cleopatra 2525 (2000-2), the historical romp Jack of All Trades (2000-1) and the Evil Dead tv spinoff Ash vs Evil Dead (2015-8). Raimi has also formed the Ghost House Pictures production company and co-produced the likes of the American remake of The Grudge (2004), Boogeyman (2005), The Messengers (2007), Rise (2007), 30 Days of Night (2007), The Possession (2012), Evil Dead (2013), Poltergeist (2015), Don’t Breathe (2016) and the tv series Legend of the Seeker (2008-10) and 13: Fear is Real (2009).